Trail 7C: Closed for the season. In the north central part of the state is the Peace Garden Trail which runs through the Turtle Mountains creating a beautiful scenic ride. 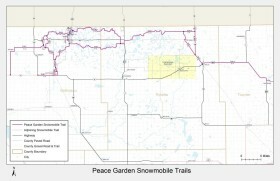 This trail system connects with the Canadian trail system at Carbury Port and at the Peace Gardens. The International Peace Gardens and the Lake Metigoshe State Park are located on the trail system.